Some say that the critical factor for condo demand in Toronto is job creation. Now I wish that was true, but it isn't. 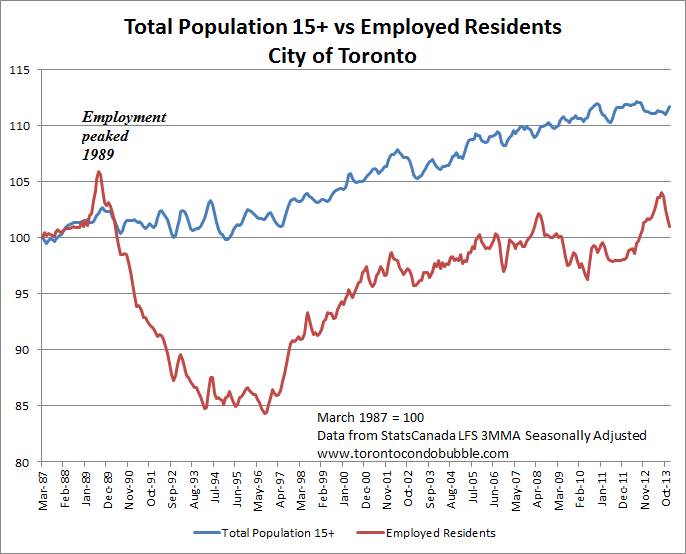 You see, the job market in Canada's largest city has been stagnating for over two decades. 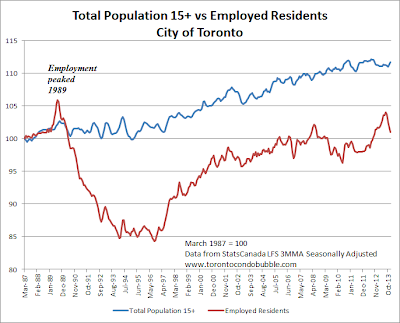 It might be hard to believe but currently there are less employed residents in the City of Toronto than in 1989 - the peak of the first housing bubble (see charts below). 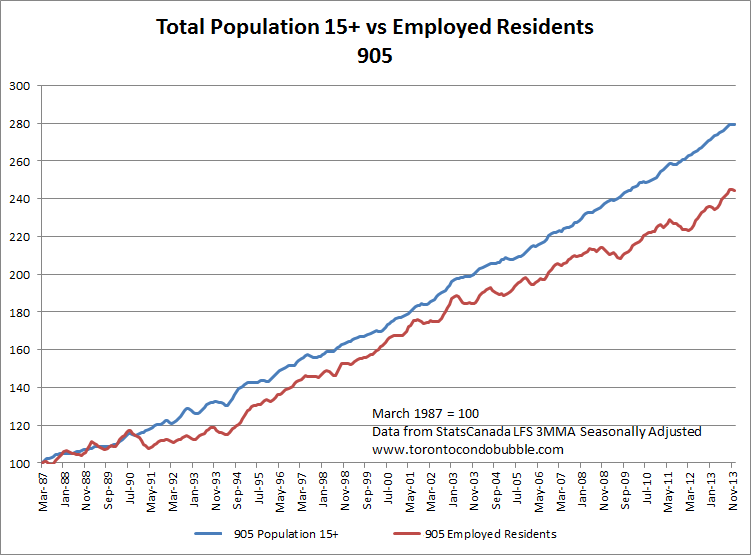 Even in the "905" job creation couldn't keep up with the population growth over the past 23 years. Compared to the rest of Canada, the job market in the GTA is an under-performer! So if both employment and incomes have been stagnating for the past two decades, then what is the critical factor for condo demand? In my view it's a widespread belief that condos (and real estate in general) are a good investment! Back to the latest job market stats. In case you missed it, the Canadian economy lost 46,000 jobs this past December. The unemployment rate jumped to 7.2% from 6.9% in November 2013. Most of the job losses were in Ontario where employment fell by 39,000 jobs. 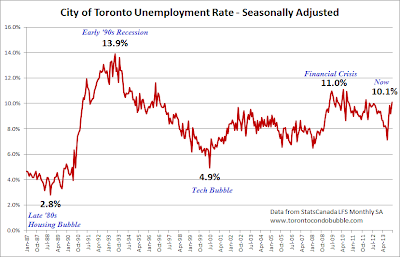 Note how the unemployment rate in the City of Toronto was ultra low during the late '80s housing bubble. Now notice what happened after the burst of the bubble! 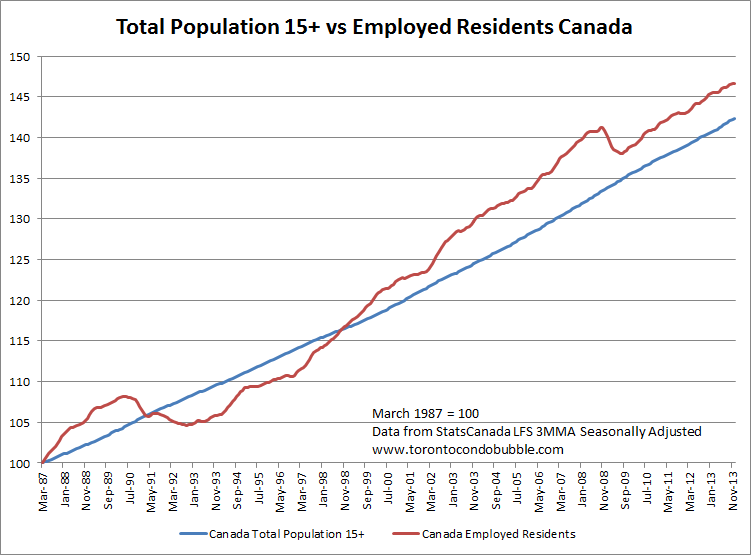 I predict that once the current condo bubble bursts, the unemployment rate will revisit the early '90s numbers! 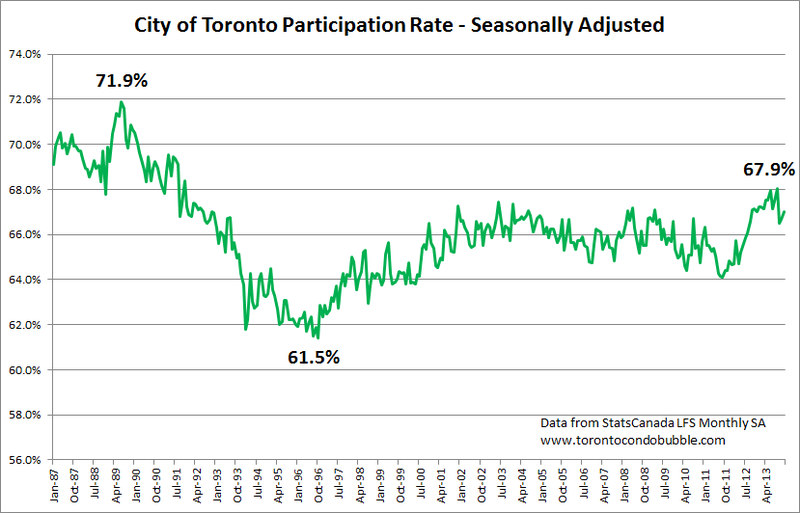 As seen on the chart above, the participation rate in Toronto peaked in 1989 and has yet to recover! Most of the population growth in the GTA was outside of the city limits. In fact, over the past 20 years the population in the City of Toronto increased by only 12% while the population in the 905 increased by more than 200%. 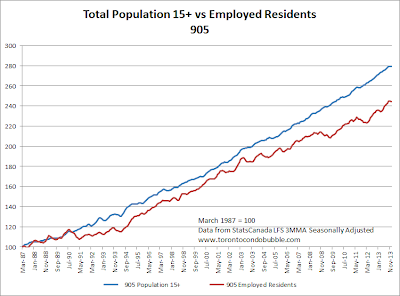 Notice how job creation in the 905 keeps lagging behind the population growth at an increasing rate since about 2002. 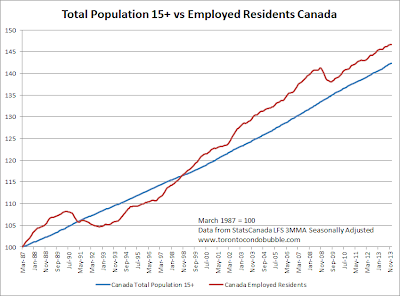 Overall in Canada, job creation has outpaced population growth. That is a good thing! As I said earlier, job creation in Toronto has significantly underperformed compared to the rest of Canada. 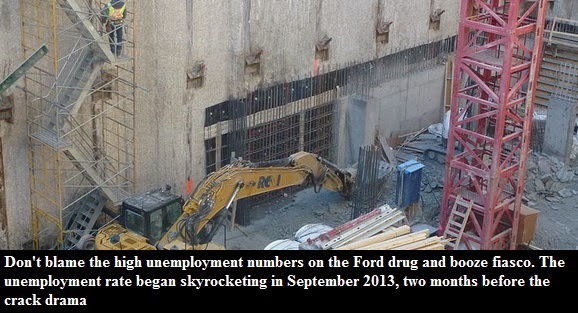 Condo construction to Toronto is like car manufacturing to Detroit. Makes you wonder what will happen to T.O. once the current condo boom ends. We all know what happened to Detroit when auto production crashed. No, it likely won't be as bad in Toronto, though it won't be good either. 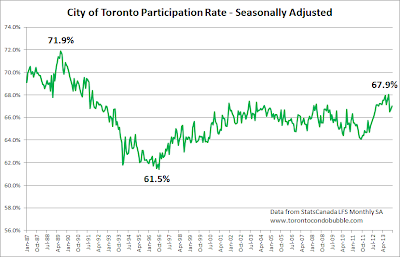 Remember that after the burst of first housing bubble in Toronto the city never fully recovered. It is quite unfortunate that Toronto is repeating the same mistake all over again! What do you think the future holds for Canada's largest city?